Bullying takes place every day and in every school. Consequently, chances are high that your child will witness bullying at least once in his lifetime. But will he do anything about it? Better yet, will he even know what to do? Here's why empowering your child to respond to bullying is important. In all bullying incidents, there is one person impacted by bullying who is often overlooked—the bystander. Although bystanders are not the primary targets of bullying, they are still affected. Some studies even suggest that bystanders may suffer more than the actual victim. In fact, bystanders can suffer from guilt, anxiety, depression, and feelings of helplessness. 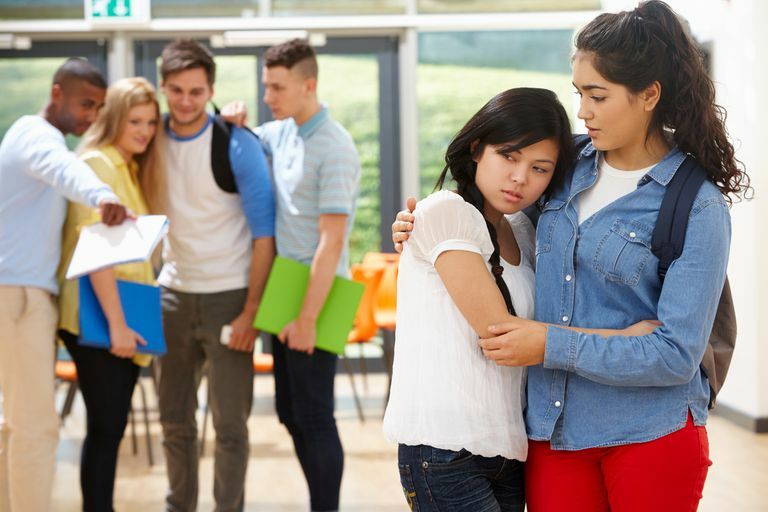 Bystanders also may experience what is known as the bystander effect which occurs when people witness an event like bullying when a large group of people are around. They are less likely to help the victim because they believe someone else will do it. Consequently, it’s important to equip your kids with the ability to recognize that bullying is wrong. It’s also a good idea to give them appropriate tools for responding to bullying. Not only does an appropriate response to bullying help the victim, but it also helps your child avoid the negative effects of witnessing a bullying incident. Talk to your kids about what they can do when they see bullying take place at school. Then, offer some ideas on how your child can respond to bullying at school. Here are some suggestions. Avoid joining in or laughing. Sometimes kids will chime in or laugh when bullying occurs. But even a nervous laugh gives the bully a response he is looking for. Explain to your children that you expect them not to join in the bullying. Even if they don’t feel brave enough to do something at the time, they can at least avoid giving in to peer pressure and laughing along with the others. Walk away. Sometimes bullies are simply looking for attention. And, if they do not have an audience, they will stop. Tell your kids that sometimes all it takes to help a victim is to walk away from the incident or to ignore the bully. Still, remind your child to report the bullying to an adult so that it doesn’t happen again. Tell the bully to stop. Usually, if a bully is not getting positive attention from the crowd, he will stop what he is doing. It only takes one or two people to show disapproval and the bullying will end. Tell your children to use this method only if they feel safe in doing so. If the bully poses a physical threat, another option might be to find help. Get an adult. Encourage your child to calmly walk away from a bullying incident and go find help. This should be done discreetly in order to keep your child out of harm’s way. But if bullying is not reported it will continue. What's more, if your child is a witness to bullying and is willing to tell someone what he saw, this goes a long way in supporting the victim. Use a cell phone to call or text for help. If your child has a cell phone, tell him that he can always call or text an adult and ask for help. In fact, Some schools have even implemented helplines where kids can text or call anonymously when someone is being bullied. Doing so, keeps him from having to say something directly to the bully, but gives him a way to help the victim. Request other bystanders stand up too. Sometimes it is safer and more effective if a group of kids confront the bully. In fact, research shows that when peers intervene in a bullying incident, the bullying stops nearly 60 percent of the time. Remind your kids that there is strength in numbers and encourage them to rally their friends to put an end to bullying at school. Address cyberbullying. Remember, your child doesn’t have to be physically present to be impacted by bullying. Witnessing a classmate being targeted online can affect your child too. Teach him how to report cyberbullying when he sees it online. For instance, your child should save the posts and report the cyberbullying to an adult. What’s more, many social media sites have mechanisms for reporting abuse. Help him become familiar with how to report harassment. Support the victim. Sometimes the best way to help is to be a friend to the victim. In fact, research shows that having at least one friend can deter bullying. Give your child ideas on how to be a friend to victims of bullying. This might mean walking to class together, sitting with them at lunch and inviting them to social events. Teaching your kids how to respond to bullying when they see it will go a long way in improving the climate at your child's school. What's more, you are teaching your kids a valuable life lesson. Learning to stand up to bullying and help others in need instills empathy. It also helps strengthen your child's character and helps him learn what is right and what is wrong.